Ibanez’s GA3 is a superb example of what an affordable startup instrument should look like. This classical gitbox is the perfect companion for anyone who’s looking to get into the world of music. The GA3 lets you in on a wonderful life long adventure that is assuredly worth the time and effort. The guitar is as affordable as it gets, while still providing an authentic acoustic tone that matches its bigger brothers that cost twice as much. The manufacturers know that not everything is about flashiness and special features, they have stripped down components from their costlier gits and transformed them into a valuable instrument, packing an excellent, raw beautiful sound which will impress you for years on end. You shouldn’t get me wrong here, a more expensive guitar packs an incremental increase in sound quality, however for the price this git carries – it’s as good as it gets. The guitar’s body is made of a spruce top and catalpa back and sides with a natural high gloss finish. The entire body speaks of quality and attention to detail. The comfort it provides is at very satisfying level due to its shape and construction. The guitar is continued by its mahogany neck attaching a rosewood hardwood fingerboard equipped with 19 frets and an Ivorex II nut which is 2 inches wide. The hardware on this instrument is very decent to say the least, ensuring excellent string durability and smooth intonation, all you have to do is play it out to your heart’s content. The guitar is finished off in typical fashion by its red headstock rigged with six chrome classical tuners. The bridge system is made of rosewood sitting atop an Ivorex II saddle. The sound output of this git is stunning, way more than what you would expect, and I’m not saying this just because we are talking about an Ibanez fiddle. All those famous tones attributed to classical guitars, which you have read or heard about, it’s all here in this beauty. Lush, melodic and extremely pleasant. The action is set up perfectly right out of the box, the strings are not too close and not too far, just the right amount resulting in an excellent playing experience. This git is an overly satisfying tool for beginners to refine their sound and style, however it can also shine through the hands of an experienced maestro. I would recommend it to anyone without any hesitation. Want my final advice? Just buy it and you won’t look back. More info about the Ibanez GA3 Nylon String , click here. 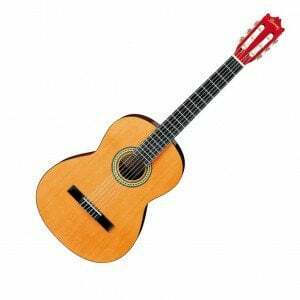 More cheap acoustic guitars on the Market, click here.